Classically Liberal: Life catches up. Sometimes life catches up and one doesn't have time to blog. Ideas run through my head daily but finding a few minutes to sit down and write is harder to find. I had to work on a business proposal and it simply had to come first. I can do two things at once I just can't write two things at once. But I did have some time to work and enjoy an old television. The other day I was out on errands and simply had to stop to use the restroom. So I knew of a large used bookstore that sells lots of DVDs and has decent public restrooms so I made a beeline for the place. As usual I couldn't resist looking around the DVDs to see what I could find. 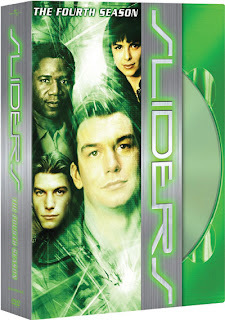 For the first time I came across the complete set of DVDs for Sliders. Produce by Tracy Torme the show had something of a strong libertarian streak in it. The first two years explored politics more than later years. In fact, Fox broadcasting started telling Torme how to produce the show and it turned to crap. I can't think of a worse botch-up in television history than what Fox did to the show once the pencil-pushers started deciding how to write scripts. It got so bad that Torme, who created the series, walked out on it. A wise move actually considering how bad the series became. While writing I went through abour 4 hours of the first season. The show tells with parallel universes where everything is the same but different. In the first episode the Soviets have control of the United States. I am looking forward to watching the first two seasons again and see some of the demise of the show in Series Three. If the last two are available, I don't know. Nor do I care. posted by blog owner at 1/25/2010 11:40:00 AM DiggIt! Reddit Del.icio.us Slashdot It!